Everyone loves boiled cabbage with ham or corned beef for St Patrick's Day, but have you ever considered roasting your cabbage instead? I must say that roasting is my preferred method for cooking vegetables because it really intensifies the flavor while bringing a toasty element to the party. So why not roast your cabbage instead of boiling it??? Now, add some bacon and you've made it FANTASTIC! I mean, lets face it, everything is better with bacon, am I right? It's the same sort of vibe you get when you do roasted Brussels sprouts with bacon. FABULOUS. The secret to the success of this dish is roasting the bacon ON TOP of the cabbage wedges. Who knew doing something so simple would be such a game changer? It makes ALL the difference! As the bacon cooks, the fat renders and drips down onto the cabbage, flavoring it with all of that delicious bacon-ness. How awesome is that? Serve it as a main dish or just as a simple side with your ham or corned beef. Oh, and just fyi, if you're choosing to restrict carbs from your diet, this one is now WAY high on your must-list because it's WAY low on carbs! BONUS! I think this is now my new favorite way to cook cabbage. And if you think you don't like cabbage, I urge you to give it a try! You just might surprise yourself!! It's REALLY delicious! Heat the oven to 450°F. Cut the cabbage into quarters and slice the bottom of each quarter at an angle to partially remove the stem core. Cut each quarter in half again so you have eight wedges. Lay these down on a baking sheet and drizzle very lightly with olive oil. Sprinkle generously with salt and pepper. 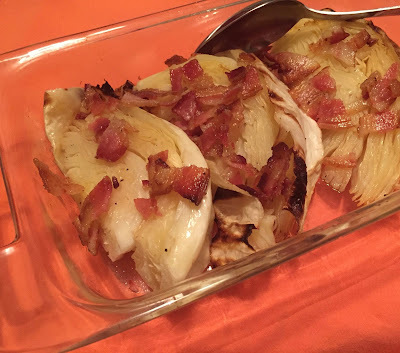 Cut each slice of bacon in half and lay on top of the cabbage. Roast for 30 minutes, flipping the cabbage wedges once halfway through. If the edges aren't browned enough for your taste after 30 minutes, put them back in for five-minute increments until they are. Serve immediately; the wedges cool down fast. To make it easier to flip the cabbage wedges, leave the bacon in larger strips and drape them across each wedge. Remove them to flip the wedges, then place them back on top again. When everything is cooked, you can cut the bacon into smaller pieces for serving, just as I've done in the photo. Easy!